played every chance you find it. main deck versus Hymns, Wheels, Memory Jars, Mind Twist, and so forth. Maybe more of a sideboard card, at least the Tactics can always be played. such, there are simply cards with more power available. 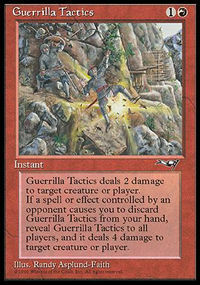 Guerrilla Tactics deals 2 damage to target creature or player. If a spell or effect controlled by an opponent causes you to discard Guerrilla Tactics from your hand, reveal Guerrilla Tactics to all players, and it deals 4 damage to target creature or player. I have always loved this card and I really wish it would be reprinted or at least modified into an even more broken form and released. First off it's burn and then against the old school discard decks it's double burn. This card would at least give red a little help today and we all know red needs all the instant burn it can get. This card was an always take in draft and I think it would still be today. One of the first cards that really punished discard. 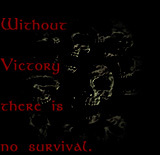 Its 2 damage for 1R was not bad in and of itself, but it really shined when your opponent made you discard it. It was then able to deal 4 damage for free. In the formats that is was and is legal, however, I would rather play Incinerate. For Incinerate, you get 3 damage, no questions asked. The occasional ability to do 4 damage didn't outweigh the need to make your opponent play a discard spell on you. In limited, however, this is removal. Alice sealed decks typically ran about 12 creatures (because there weren't that many creatures in the format). Therefore, being able to take out one of your opponent's creatures gets a much higher value in that format than it would in a limited format today. And, in a pinch, you can always throw it at your opponent to finish them off. This card brings back memories. There was something very special about getting Hymned turn 2, and then them picking two of these. Hippies taking them were very nice as well. Take 2 once, then burn the crap outta that silly hippie. Old school players will like this card. In limited, burn is burn. It's cheap, effective, and always playable. the hell is THAT!?!" moment in extended or any format. In constructed, a 2.